We want to improve walking and cycling along the proposed Quietway 14 between Canada Water and South Dock. We asked what you thought of our proposals to improve the existing Albion Channel Bridge, a new South Dock Lock movable bridge, improved pavement surfaces, speed calming, parking, urban realm, signage and marking improvements. In total, there were 26 respondents. It is worth noting that the consultation response rate was very low but in general, the consultation results were positive. We will be making some changes to our proposals that better address your concerns and suggestions - see the link to the Individual Decision Maker report here. These proposals will proceed onto subsequent design phases, followed by statutory consultation, and construction in the summer of 2019. Quietway 14 is a walking and cycling route between Blackfriars and Deptford. As part of this consultation, we are proposing to implement the section between Canada Water and South Dock, and would like your views. Quietways are a part of a Transport for London programme to implement a network of continuous and safe cycle routes across London. Linking key destinations, they follow backstreet routes, through parks, along waterways or tree-lined streets. The routes are not just for experienced cyclists but for anyone who wants to use quieter, low-traffic routes, providing an environment for those cyclists who want to ride at a more leisurely speed. Quietways form an integral part of the Council’s objective to significantly increase the number of residents who opt for cycling as their preferred mode of transport, particularly when making local trips. This section of Quietway 14 is proposed to run between Canada Water and South Dock. The proposals follow key principles of the healthy streets approach which includes improving the quality of public areas to make walking and cycling pleasant and enjoyable, and improving the health of local residents. You can see maps for all the proposed changes in the PDFs at the bottom of this page. Redriff Road underpass – where we want to make public realm improvements and improve lighting. Albion Footbridge – where we are widening the ramp and the bridge, and improving the pavement surface. 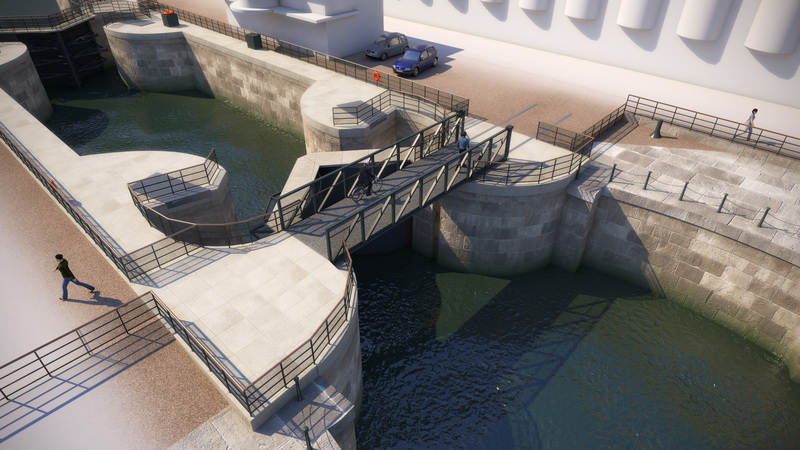 New South Dock Lock Movable Bridge - where we are providing a new bridge to improve walking and cycling connectivity to Lewisham whilst maintaining full boat access to South Dock Marina. Other areas for improvement include measures to improve pavement surface, calm speeds and improve visibility for pedestrians and cyclists on Albatross Way, Needleman Street, Albion Canal, Brass Talley Alley, Archangel Street, Russia Walk, Russia Dock Woodland, Lady Dock Path, Bonding Yard Walk, Finland Street, South Sea Street, Rope Street, and Princes Court. You can provide feedback on the route proposals to by visiting the "tell us what you think" online questionnaire below. We will finish gathering information on Monday 18 December 2017 so please submit your comments by that date. If you require a hard copy, call us on 020 7525 2347, email us on highways@southwark.gov.uk or write to us at Highways, level 3, 160 Tooley Street, London SE1 2QH. The consultation responses will be analysed and taken into consideration in the final design proposals. Because of the large number of anticipated responses, regrettably we cannot respond personally to specific issues raised. However, all comments and suggestions will be considered before a decision is made. We will aim to present the consultation results and recommendations to the Bermondsey and Rotherhite Community Council meeting in January 2018. A formal decision on the scheme will be taken by the Cabinet Member for Environment and Public Realm in early 2018.